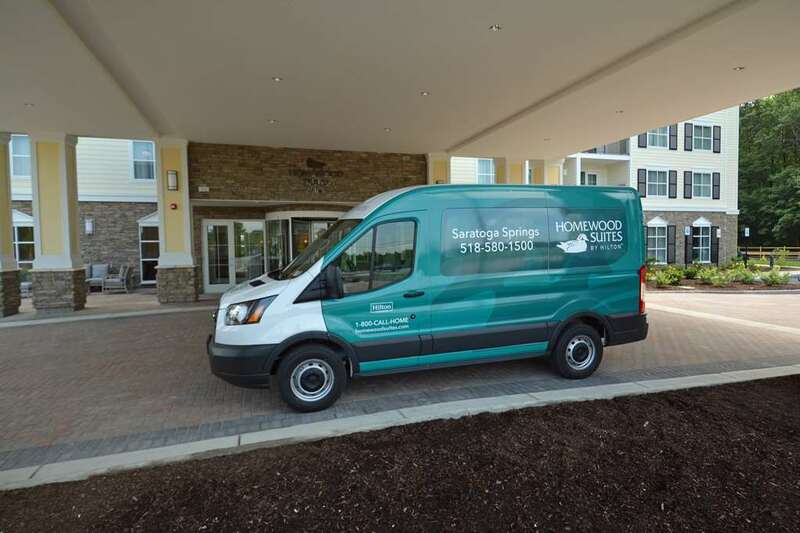 Welcome to Homewood Suites by Hilton Saratoga Springs. Conveniently located at the foothills of the Adirondack Mountain our modern hotel is just one mile from the historic Saratoga Race Course Saratoga Casino and Raceway and Saratoga Performing Arts Center. We are also just minutes from area business locations including Globalfoundries BMPC-Knolls Atomic Power Lab and US Navy-West Milton Site. You*ll feel at home from the moment you arrive at our all-suite hotel. Wake up each morning to a free full hot breakfast and enjoy complimentary evening dinner and drinks* Monday - Thursday. Our spacious studio one and two-bedroom suites feature all the comforts of home including an HDTV complimentary WiFi and a fully equipped kitchen. Maintain your exercise routine in the fitness center borrow a bicycle from the hotel or enjoy a game on the sports court. The hotel also features an indoor pool and hot tub as well as an outdoor patio with fire pit and comfortable seating. Business travelers will appreciate our flexible meeting space business center and complimentary WiFi access throughout the hotel. *Subject to state and local laws. Must be of legal drinking age. Northern Italian cuisine - myriad wines in stylish digs sporting unique metal accents - an onyx bar. Elegant bistro/tavern with a lively tree-topped patio dishing out Continental cuisine since 1932. Fresh. From daily Ocean to Table seafood specials to our in-house herb garden we focus on freshness. Globally accented American fare plus craft beers - cocktails on the ground floor of a condo complex. ~27 miles from Saratoga Springs. Resembles an old-fashioned cheese press. Honors a 1,234-pound cheese that was made for Thomas Jefferson in 1801. Its critics mocked it as "The Mammoth Cheese," and the name stuck. ~47 miles from Saratoga Springs. An old roadside standby still operates along bypassed Highway 20. ~48 miles from Saratoga Springs.